Ron created this ” Surfboard in Coral ” while I was on a cruise snorkelling and looking at coral ( No surfing though) . He made the surfboard by doing a wire melt in the kiln. 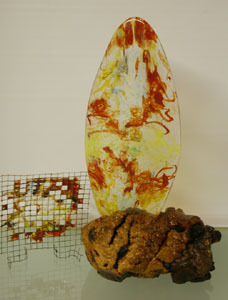 In this case he used 2500g of clear and bits of colour, melted through the wiremesh you see on the left into a ceramic mould the shape of the surfboard. The coral is a piece of manzanita root , sandblasted and then lacquered with a slot cut into it using the tip of the chainsaw. The surfboard can be removed from the coral. I am leaving on a quilting trip soon – can’t wait to see what he makes while I am away.